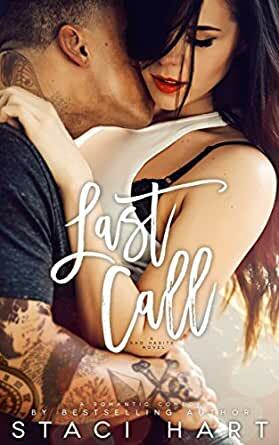 Last Call is a bestselling standalone romantic comedy and third book in the Bad Habits series. Shortly before the events of the first book of the Bad Habits Series, With a Twist, Rose and Tricky (Patrick) had been in a relationship. One that eventually imploded, primarily due to the fact that all of the big conversations about how they felt, where they hoped their relationship was going ... all of it, were all continually put off, leaving nothing but guesses and assumptions to fill the void, and we all know what they say about assumptions. Throughout both books, West and Lily's story and Cooper and Maggie's (Chaser), both Rose and Tricky are there in the background. Neither happy about their recent break up, neither hopeful of a possible reunion, neither ready to move on. Just stagnating, each in their own little pool of torment and turmoil. Last Call, tells the thought provoking and heartfelt story of what happens when they separately resolve to do just that. At least Tricky resolves to get back together with Rose even while Rose has determined that its time to move on without him. Rose's attempts to find someone new in a modern city filled with millions of people are disturbingly funny, and at times bittersweet, while poor tragic Patrick finally has an objective ... get Rose back ... but no plan as to how. Woven through it all are wonderful subplots dealing with the themes of living your passion, addiction, loyalty and above all, friendship, since at the end of the day its friendship that brought this wonderful cast of characters together in the first place, not least of all Tricky and Rose themselves. Written as a interrelated standalone from alternate POVs I could clearly see how this book would work on its own, but appreciated the richness that reading the other two stories beforehand added to the feel of the relationships and cohesiveness of the central group of characters. Staci Hart​'s writing style was easygoing and enjoyable with the drama and shenanigans liberally scattered throughout creating a complex web of ideas and characters that all accumulated into a beautiful little gem of a book that I simply didn't want to put down. I firmly expect it wont be too long before I go back to the start and re-read the entire series. Loved it. I found it quite hard to get into the story as I didn't find either lead character particularly likeable or relatable. I think the the storyline itself was well thought out and definitely had its merits but as a whole I wasn't able to enjoy the book. Those pesky proofreading errors persist, but this is still a good read. The characters feel real, their issues don't come across contrived, and the outcome is always a HEA. With a Twist left me a giddy mess twisted in the aftermath. Chaser left me chasing those heart stopping moments over and over again. And Last Call left me in an everlasting state of survival. 5.0 out of 5 stars5 BROKEN STARS! Last Call was the most anticipated finale to an epic series that had me falling from the very first page. Weston Williams captivated my heart, Cooper Moore became my soulmate, and Patrick Evans was everything in between. You'll never meet a man quite like Patrick Evans. He's someone that loves deeply, but hides his emotions from the world. With his intense stare and brooding nature, the only way to know what his feelings truly are is if you look at his art. His paintings. The images his soul reflects, and each piece holds a piece of Rose. Lily is the dancer, Maggie the dreamer, and Rose, she's the girl who fought and cheered on for everyone else's happily ever after... but her own. Rose Fisher, like Patrick never experienced affection and love from their families until they're introduced to the Habits crew. Rose is heartbroken, stubborn, and rather be alone then to ever have to endure such aching and weak pain again in order to protect herself. What Rose never understood was the fact that Patrick was the person her soul yearned for. Their souls called to one another fighting to stay together through the storm. But both troubled, damaged, and broken fought tooth and nail to ignore the other. After a while those walls soon began to crumble leaving behind intense chemistry and sexual frustration. But nothing in life is easy and their love wasn't easy as well. There was a lot of soul searching and learning to forgive between these two characters. Learning to accept each other's flaws for what they are. Through it all they became that much needed strength the other needed in order to survive-together and this time for good. Now that I've reached the conclusion of a beautiful and epic series I'm left a little sad and lost wondering what's next. Staci Hart has left an imprint in my heart and soul with these characters and their stories. They've become a part of me and will forever live on in my heart. Meanwhile, I sit back and wait anxiously and patiently wanting more; wondering where her next adventure will take me.